1937 1938 1939 Ford Halogen Headlight Conversion Reflector Kit w Turn Signal. 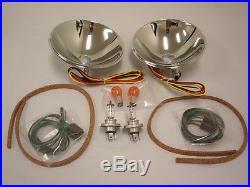 This is a brand new 1937 1938 1939 Ford car quartz halogen reflector kit. These reflectors upgrade the lighting on your original Ford car while fitting perfectly into your original headlight buckets. This kit also includes a modern turn signal feature, putting the turn signal just below the light bulb inside the bucket, just like the expensive after-market assemblies. (2) Die Stamped, Chrome Plated Reflectors with Special Sockets Installed (7 diameter). (2) Quartz Halogen Bulbs (12 volt). (2) Amber Dual Filament Bulbs for Parking and Turn Signal Circuits. This kit is the ideal way to modernize the lighting on your original street rod without replacing the entire bucket assembly. These will fit right into your existing buckets and use the original lenses and trim rings. This kit is designed specifically for use with the original style fluted lenses, it will not shine light properly when used with the after-market clear lenses. New parts are being added daily! Whether you're a novice rodder or an experienced builder, there is something here for you! Please wait for us to send you a combined invoice before paying. We have discount prices on thousands of parts for your Street Rod, Hot Rod, and Custom Car or Truck. Parts are added to our store daily, so check back often for the latest deals! Plus, we have access to thousands of parts that are not listed. We do get hundreds of emails daily, so at times it may take us up to 72 hours to respond to your emails. The item "1937 1938 1939 Ford Halogen Headlight Conversion Reflector Kit w Turn Signal" is in sale since Tuesday, March 11, 2014. This item is in the category "eBay Motors\Parts & Accessories\Car & Truck Parts\Lighting & Lamps\Headlights". The seller is "gearheadworld" and is located in Hudson, Iowa.